French President Emmanuel Macron has decided to take the hit for the unfolding Alexandre Benalla affair, saying he’s responsible for all the actions of his violent aide, who was filmed beating demonstrators during a May Day rally. Emmanuel Macron’s presidency is being battered by its worst scandal so far and at the center of it is the protester-beating bodyguard Alexandre Benalla, a young man with a surprisingly successful career On May 1, a man wearing a police helmet was filmed roughing up unarmed protesters at an anti-Macron rally in Paris. 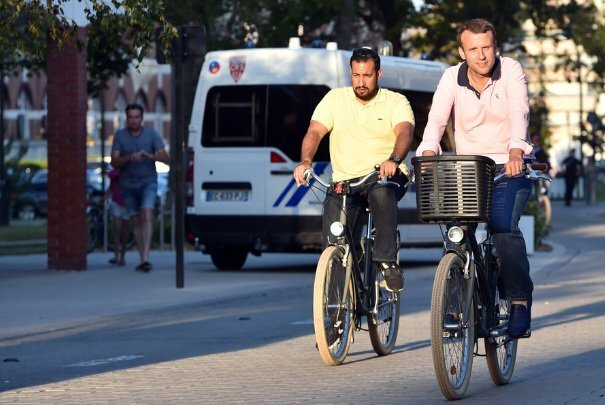 In mid-July, he was identified as Macron’s bodyguard Benalla. This has given rise to a scandal that could swell up to what the opposition called& with French politicians baffled by the lengths to which Macron’s team has gone to protect the bodyguard. Macron on Tuesday called the scandalous May 1 events a “betrayal,” adding that he had “trusted” Benalla. The French president at the same time stressed that he was also the one who authorized a “sanction” against the rogue aide, adding that none of his staff was above the law. The said sanction, however, had seemingly only taken effect when the affair went public, which forced the presidential administration to sack Benalla. Immediately after the incident, Benalla got away with only a two-week suspension without pay. The violent aide was later spotted overseeing the security of the French football team’s bus during their triumphant return from the 2018 World Cup.